Footage of the stunning mammals was captured around the Blaskets and Dingle Bay last summer. The resulting film is set to air over two nights this week. THE BBC IS set to air the first part of its report on humpback whales off the coast of Kerry this evening as part of the ‘One Show’, with the second installment to follow tomorrow night. Filmed, in part, aboard Charlie Haughey’s old yacht the ‘Celtic Mist’ (which was donated to the Irish Whale and Dolphin Group by the former Taoiseach’s family) the footage was captured off West Kerry in August of last year. The initial plan had been to run the story in just a single slot — but, according to the IWDG, the shoot was so successful the unit got enough footage for wildlife presenter Mike Dilger to tell the story over two days. It’s not the first time crews from the British broadcaster have paid a visit to Irish shores to film our large whales. The likes of Autumnwatch and Winterwatch conducted shoots off Waterford and West Cork in recent years. 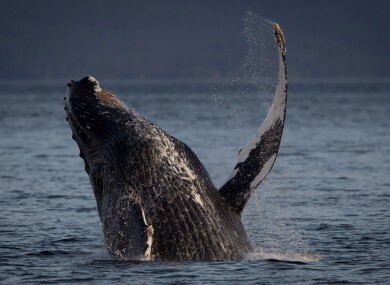 However, almost 70 per cent of all humpback whale sightings off Ireland in 2014 were made in the waters off Kerry — in particular, around the Blaskets and Dingle Bay. Moving the operation to the area was “a fairly easy decision” according to the IWDG’s Pádraig Whooley. “The bonus was that we also got the showcase the great resource that is the IWDG’s yacht, Celtic Mist, which performed wonderfully over the shoot,” he writes, on the group’s website. We hope that this footage will encourage some funding from tourism agencies or companies who see the enormous potential for using iconic and rare species like humpback whales to showcase the very best of Ireland’s marine wildlife along our Wild Atlantic Way. The One Show airs tonight at 7pm. Email “Kerry humpback whales to appear on BBC tonight (and --- believe it or not --- there's a Charlie Haughey connection)”. Feedback on “Kerry humpback whales to appear on BBC tonight (and --- believe it or not --- there's a Charlie Haughey connection)”.